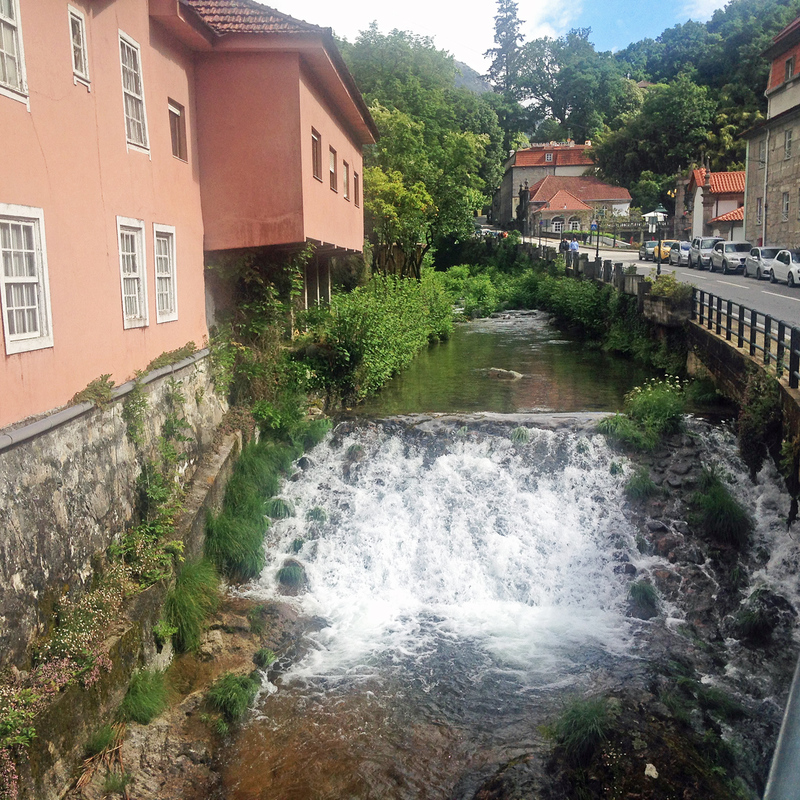 Arriving in Portugal, the westernmost European country, geographically closest to the U.S., I was thrilled to start touring the nature parks and quaint villages surrounded by granite mountains, crystal-clear waterfalls, mixed forests, and abundant wild flowers everywhere from foothill meadows to country roads. 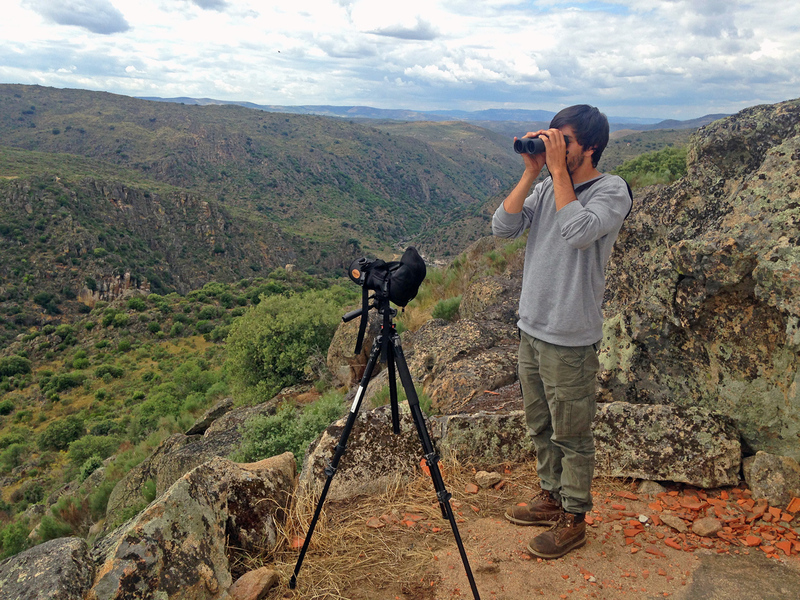 It was the very beginning of summer – the best time to explore Portugal’s glorious biodiversity. Daily weather patterns changed from cool breezes to occasional rains, to unexpectedly hot sunrays peeking through the dense clouds – a keen reminder of the country’s close proximity to Africa. The air was fresh, and filled with fragrances of blossoming linden, chestnut, and jacaranda trees. I felt immediately in love! It started with my first acquaintance with Lisbon – a capital city where comfortable and well-served TAP Air Portugal flights bring American travelers directly from the East Coast. Only a short stroll through the spacious Terreiro do Paco (“palace yard”) by the Tagus River was feasible before leaving the city and heading up north, and so I walked around the equestrian statue of King Jose I during whose reign the Great Lisbon Earthquake, tsunami, and fire of 1775 destroyed the royal palace, its yard, and almost the entire town in the unprecedented natural disaster. 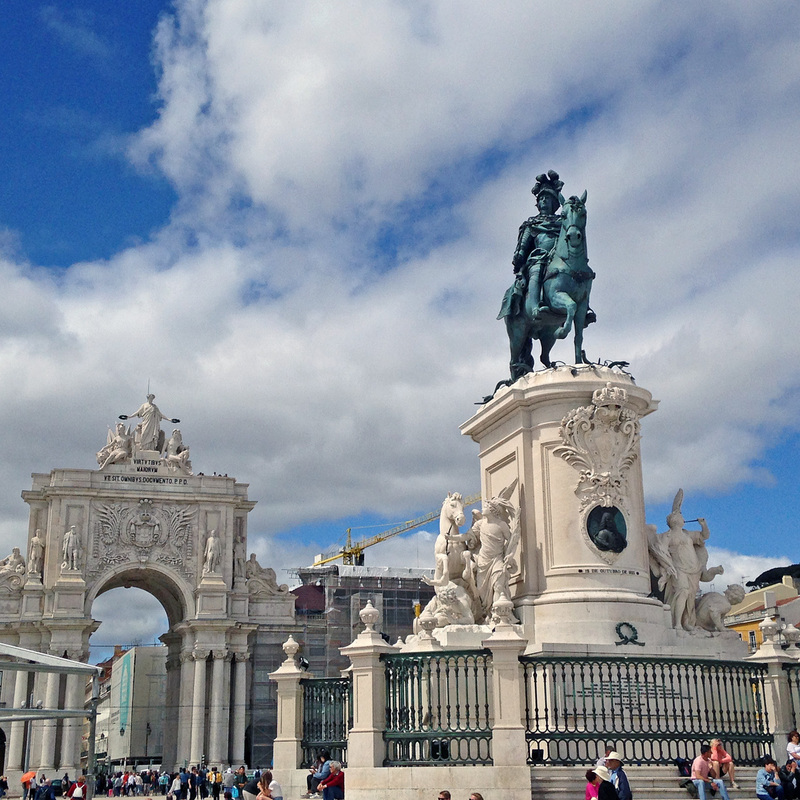 Currently known as Praca do Comercio, the gorgeous city square is home to many shops and restaurants. Lunch at Can the Can was a wonderful introduction to Portuguese cuisine – bold, distinctive, and very healthy, too. Can the Can emphasizes Mediterranean cuisine defined by the use of natural ingredients, and the art of food preservation, developed over the ages. (The canning industry in Portugal, a country with an extraordinary coast and ancestral tradition of fishing, dates back to 1865). Most dishes are based on a combination of high quality canned fish and fresh vegetables. Immediately after lunch, our small group of three American journalists and a local guide and an excellent driver, Jorge Roque dos Santos, hit the road. Entering Obidos, an ancient walled city on the Atlantic coast, with a medieval castle and multiple historical churches, we were greeted by a bustling souvenir market along a cobblestone main street. The familiar blue-and-white design – a signature feature of Portuguese handcrafted tiles that decorate almost every building in the country was echoed by contemporary artisans’ creations. After an invigorating walk through the town and around the castle, we settled for at The Literary Man Hotel, where all walls, nooks and crannies were lined with books, and a live band was playing at the restaurant during a candlelit dinner. 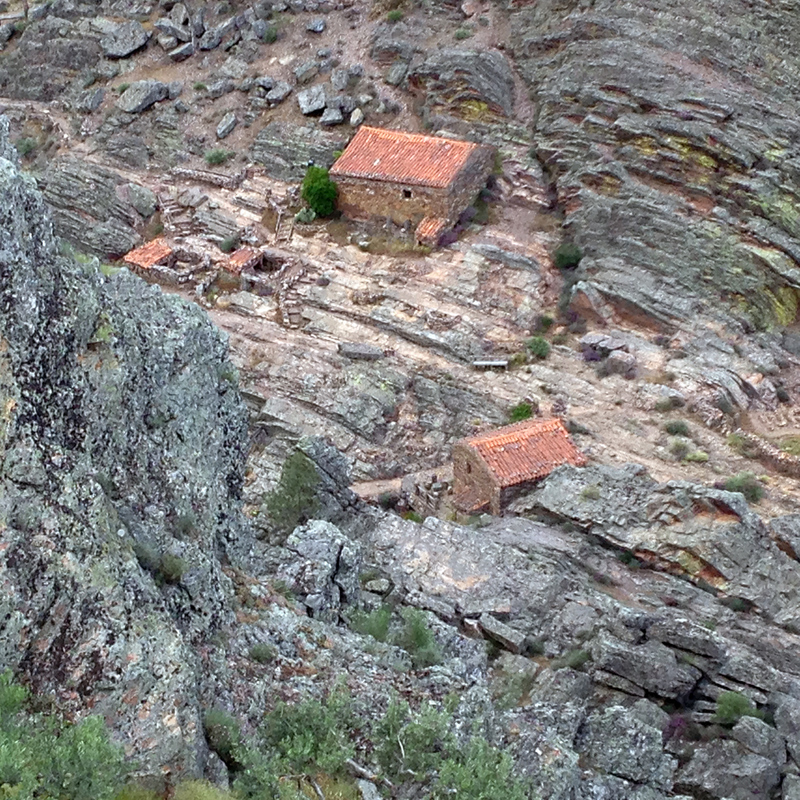 Following our route, the next morning we departed to Monsanto in Central Portugal, a fascinating hillside village where every little dwelling is built of stone or even of huge granite boulders that form foundations, walls, and roofs of the houses. A part of a massive 5000-square-kilometers nature park Geopark Naturtejo, Monsanto is filled with wondrous sites along its steep and narrow streets enlivened by blossoming rose bushes. Guided by Joana Rodrigues, a geologist employed by the geopark, we climbed up to the village castle to indulge in panoramic views of the entire region defined by white-walled houses under red-tiled roofs. At lunch, at Petiscos & Granitas Geo-Restaurante we were seated next to a bulging boulder imbedded in the wall, and served the freshest house-made sausages, cured meats, and traditional salt cod made with spinach and bread crumbs into a delicious mush. We then departed to Penha Garcia, also a part of the Geopark Naturtejo, the first Portuguese nature park dedicated by UNESCO in 2006. In this place, history goes way back, to a Neolithic settlement, later turned into a Lusitanian fort, and then into a Roman village. Just a few miles away from Spain, Penha Garcia offers spectacular views and a beautifully tiled drinking water fountain – one of many in this mountainous region where spring water is delivered to you uncompromised, straight from the source. Tired, but happy and content with all the impressions of the day, we arrived at a posh Hotel Fonte Santa in Termas de Monfortinho. Built in the 1940s, during a period of intense interest in the thermal waters of Portugal, the renovated and upgraded hotel opened its doors in 2005. 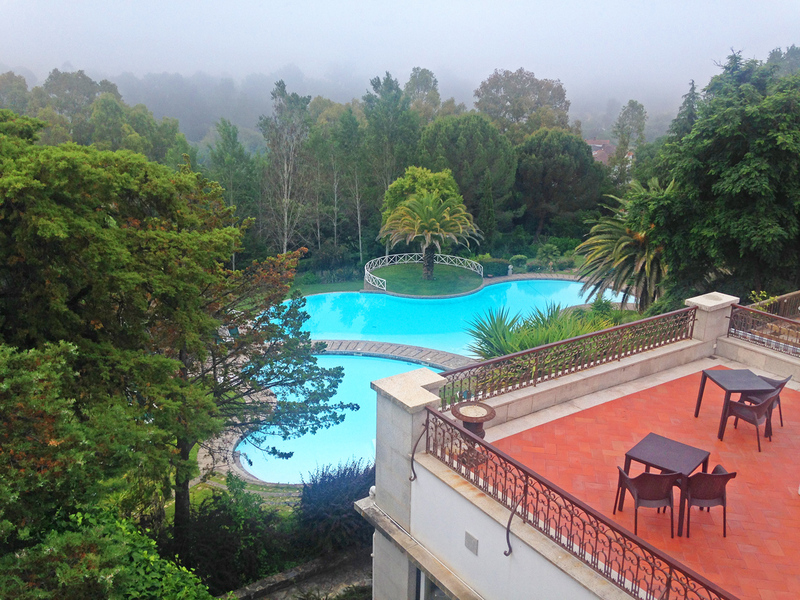 A spectacularly appointed property on a hilltop, with a blue swimming pool shimmering in the morning fog, it will stay in my memory as a dream that couldn’t materialize due to our short one-night stay, and the inclement weather that wouldn’t allow me to take a dip. 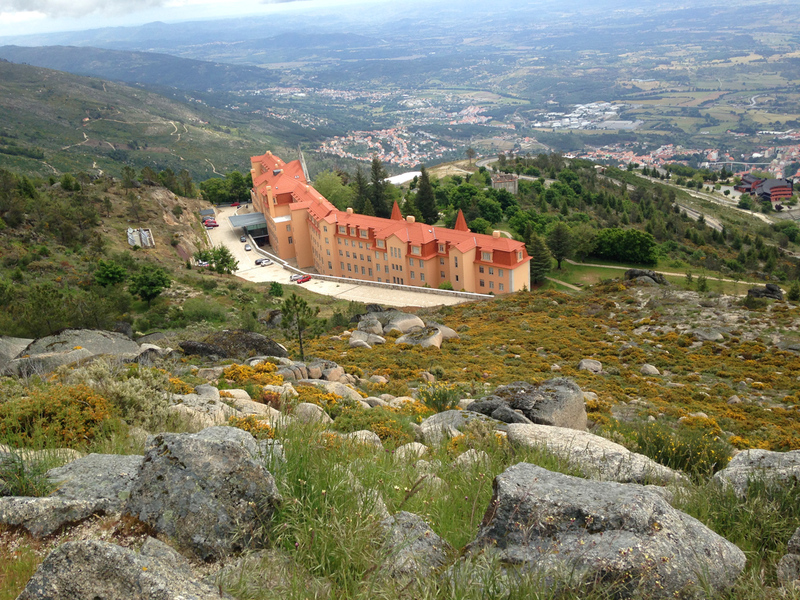 Our next day tour was dedicated to Serra da Estrela Natural Park – in the heart of the country – the highest mountain range in Continental Portugal. Our knowledgeable guide, Manuel Franco from a nature tourism company, Portugal A2Z, took us around on steep drives and easy hikes, and pointed out various curiosities from the characteristics of geological formations to the quirks of local flora, and from a history of a TB sanatorium turned upscale hotel to an absolutely a hidden gem of a lunch place, Varanda da Estrela. Here, we indulged in freshly-cooked meats (lamb, goat, black pig) produced by local farmers with a traditional Portuguese garnish of olive oil-braised whole young potatoes. 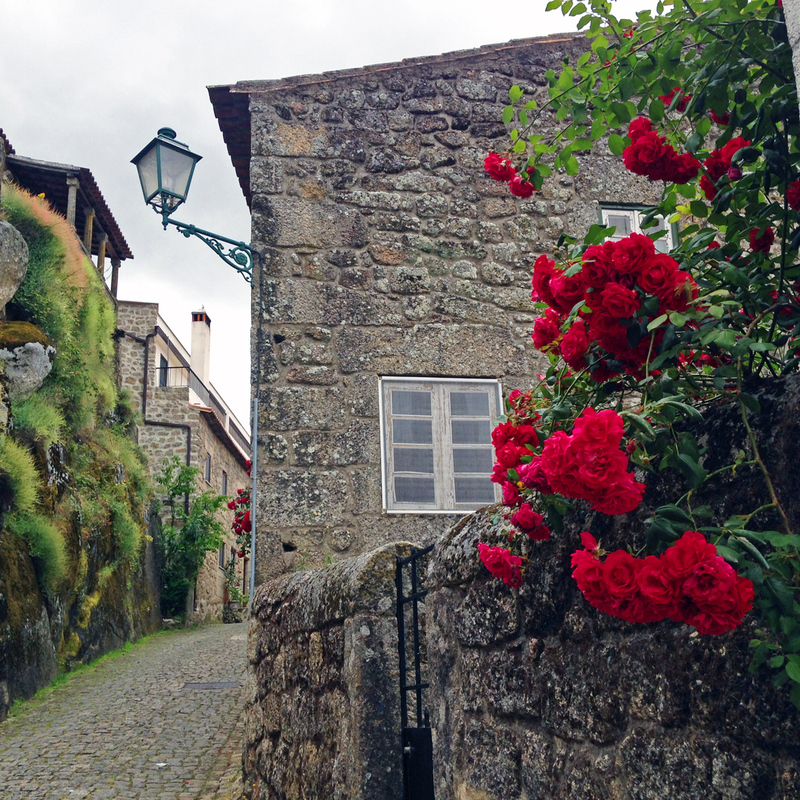 A historical village of enchanted beauty, Castelo Rodrigo lay ahead, steeped in time and wrapped in a misty drizzle. 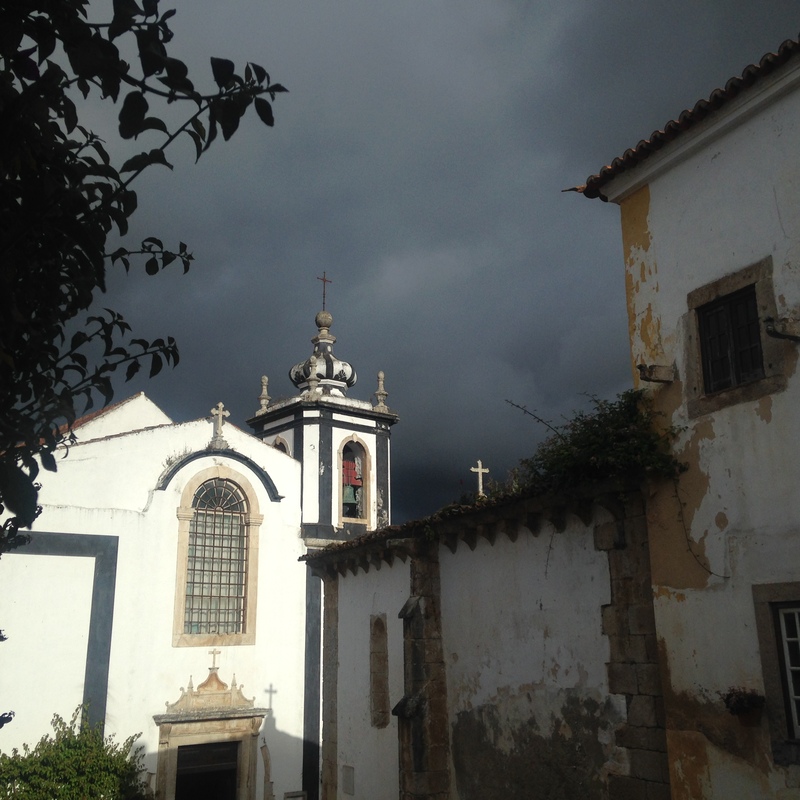 By the time we’ve arrived, the sun, still invisible behind the clouds, was setting, and our home-made dinner was quickly delivered to an elegantly set table by Ana Berliner, the hostess of a boutique hotel, Casa da Cisterna where we were about to spend the night. A biologist, born in Lisbon, and later enamored with the Coa Valley area, Ana settled in Castelo Rodrigo with her husband and daughters, and became a hotelier/restaurateur extraordinaire. On top of that, she entered a licensed guide program for Coa Archeological Park UNESCO World Heritage site of Paleolithic engravings found by the Coa River. The prehistoric rock engravings were discovered in Vila Nova de Foz Coa in the 1990s during a study for a proposed dam construction, and the archeological park was created in 1996 as an open air museum. That night, Ana took us on a tour of the engravings, and with a strong flashlight in hand, showed us line by line and curve by curve the amazingly precise depictions of longhorn cows, horses, and deer, still pertinent to the area, and a mind-boggling image of an upstream-flowing salmon mirroring the nearby real river flow direction. 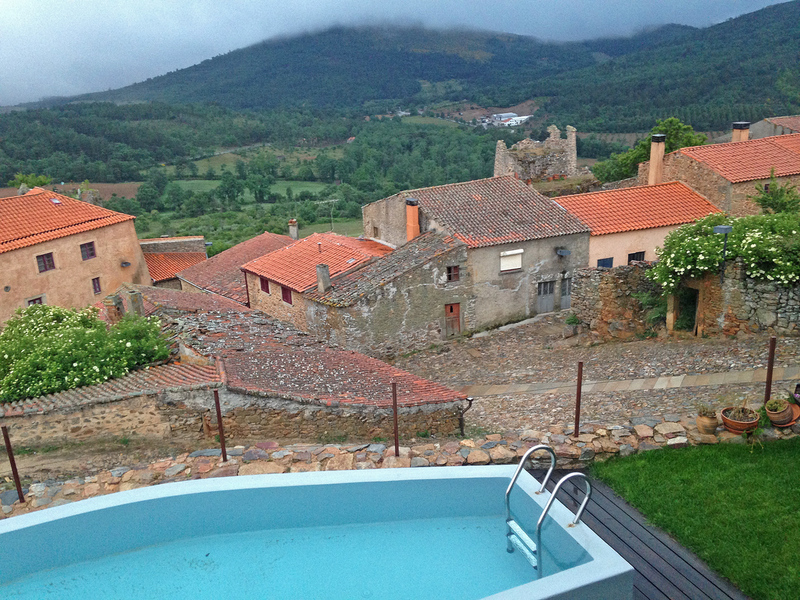 Once again, a shiny blue swimming pool by the hotel, made out of an old cistern that served as a water reservoir for the village and gave its name to Casa da Cisterna, remained but a dreamy vision. We had to depart early morning for Faia Brava Wildlife Reserve, also in the Coa Valley. Now looking back at all the wonderful nature parks of Portugal I was so lucky to visit on this trip I can decidedly say that should there be only one park to visit and only one wildlife area to explore I would be heavily biased toward Faia Brava. The sheer vastness of this rocky hilly area studded with cork oaks and bright bursts of fennel and lavender shrubs and red poppies, a V-shape valley down below with a river running through it, its tall cliffs and boulders, its sunny meadows carpeted with white and yellow flowers, and especially its wildlife makes Faia Brava a dreamland for a nature lover. The first privately owned protected wildlife habitat in the country, Faia Brava is a pilot area of the Rewilding Europe project since 2010. Met at the park entrance by two experts on the area – Luis Pedro Ribeiro from Transumancia e Natureza Associasao (a non-profit environmental NGO) and Dr. Henk Smit – a board member of the park, our group was taken on an exciting adventure in the wilderness, devoid of human presence, and admittedly rarely traversed by hikers and bikers. On our journey we visited a high point from which we could observe through a telescope rare species of Griffon vultures and Egyptian vultures nesting in the cliffs. We met a family of wild Garrano horses with shiny, as if polished, chestnut-colored bodies and long raven-black manes. We couldn’t get enough of winding trails, partially conquered in a four-wheel drive, partially on foot, until it was time for lunch, and our gracious hostess from Casa da Cisterna, Ana Berliner arrived on the scene again with a home-made lunch of incredible delicacies and a bottle of champagne! At our next stop, at Hotel & Spa Alfandega da Fe we were finally able to indulge in a serene warm spring-fed pool before a lavish dinner of Portuguese specialties at the hotel restaurant. Early in the morning we continued our journey to Geres – a thermal spring area in the north, long known as a healing resort for countless ailments. Geres village is a charming and well-equipped visitor-oriented place with several nice hotels (we stayed at the grand Aguas do Geres Hotel, Termas e Spa), good restaurants (our lunch at Petiscos da Bo Gusta was freshly prepared and tasty), and a gorgeous park with old trees and a waterfall running through the city streets. From Geres, we explored the surrounding parkland and more of the fairy-tale little villages. Peneda Geres National Park, located along the border with Spain, is formed by a 300-million-year-old granite mountains and the Homem River. It contains countless labyrinths of serpentine trails among the pines and oaks, with good paved roads often invaded by pasturing cows and wild horses. In our exploits, we stopped for lunch at a Restaurante Espigueiro do Soajo, known for its young wines traditionally served in little bowls, and its extensive menu of house-made meat dishes made with local lamb, pork, and goat. 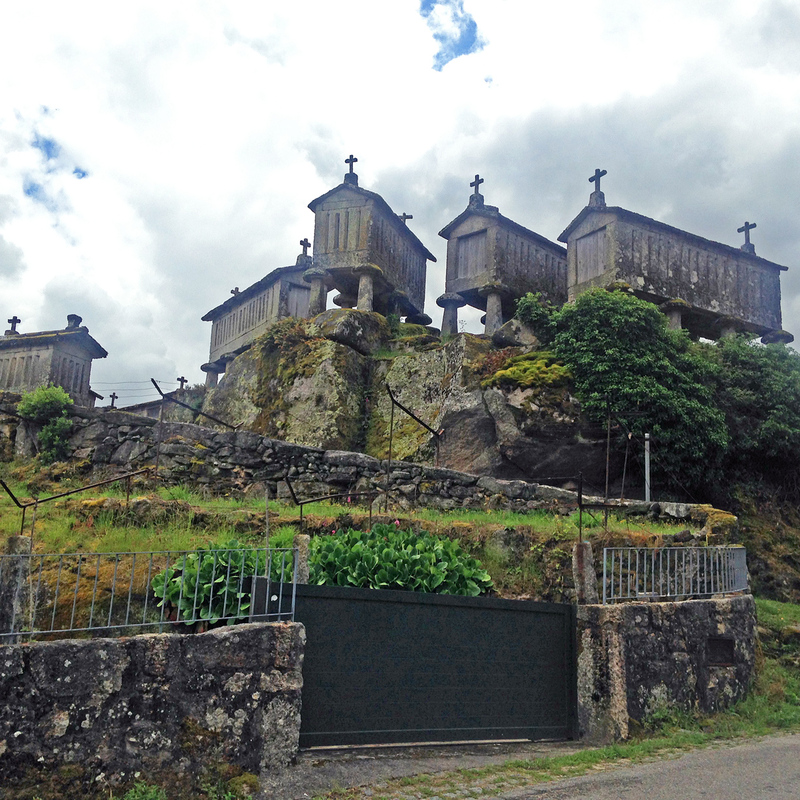 The village of Soajo is famous for its ages-old rustic corn storage houses on stilts, mysteriously-looking and adorned with crosses to ward off evil spirits. 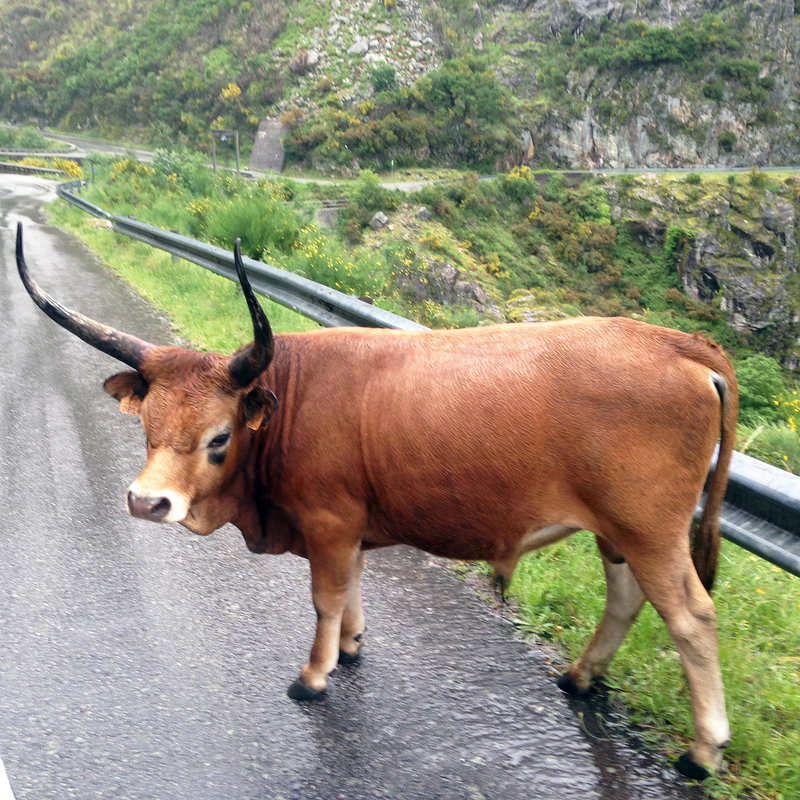 I must say that in our entire journey through the nature parks of Portugal we’ve met only benevolent spirits – friendly locals, smiling, easily engaging, and ready to help even if we all had to rely on non-verbal communication to be understood by each other. In my book, Portugal is a great tourist destination – immensely beautiful, hospitable and safe to travel. Find out more at: www.visitportugal.com, www.centerofportugal.com.